In order to gain proficiency in CentOS 6 system administration it is important to understand the concepts of runlevels and services. The goal of this chapter, therefore, is to provide a basic overview of the different runlevels supported by CentOS 6 combined with an overview of how to configure the services that start at each level. CentOS 6 can be configured to boot into one of a number of different runlevels. During the boot sequence, a process named init looks in the /etc/inittab file to find the default runlevel. Having identified the runlevel it proceeds to execute the corresponding startup scripts located in the /etc/rc.d sub-directory. For example, if a default runlevel of 5 is configured the init process will work through the list of startup scripts located in /etc/rc.d/rc5.d. These startup scripts start either with the letter "S" or "K" followed by a number and then a (hopefully) descriptive word. 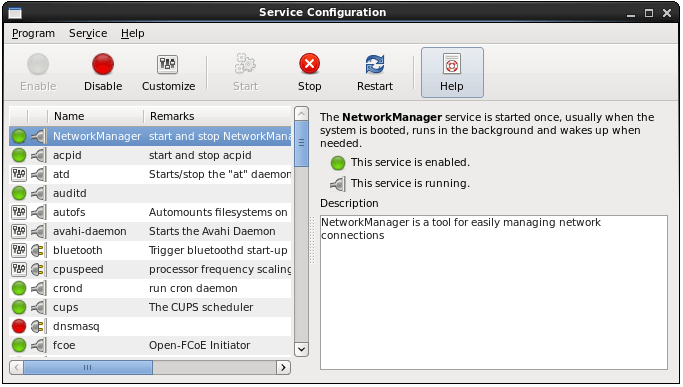 For example the startup script for NFS (Networked File System) is typically K20nfs whilst the startup script for the sshd service might be called S55sshd. Scripts that start with an "S" are invoked before those prefixed with a "K". The number in the filename controls the order in which the script will be executed with that group (either "S" or "K"). You wouldn't, for example, want to start NFS before the basic networking is up and running. It is also worth noting that the files in the rc.d sub-directories are not the actual scripts themselves but rather symbolic links to the actual files located in /etc/rc.d/init.d. A service is essentially a process that typically runs in the background to provide specific functionality. The sshd service, for example, is the background process (also referred to as a daemon) that provides secure shell access to the system. Different runlevels are configured to automatically launch different collections of services, depending on the functionality that is to be provided at that particular level. Runlevel 0 - The halt runlevel. This is the runlevel at which the system shuts down. For obvious reasons it is unlikely you would want this as your default runlevel. Runlevel 1 – Causes the system to start up in a single user mode under which only the root user can log in. In this mode the system does not start any networking, X windowing or multi-user services. This run level is ideal for system administrators to perform system maintenance or repair activities. Runlevel 2 - Boots the system into a multi-user mode with text based console login capability. This runlevel does not, however, start the network. Runlevel 3 - Similar to runlevel 2 except that networking services are started. This is the most common runlevel for server based systems that do not require any kind of graphical desktop environment. Runlevel 4 - Undefined runlevel. This runlevel can be configured to provide a custom boot state. Runlevel 5 - Boots the system into a networked, multi-user state with X Window System capability. By default the graphical desktop environment will start at the end of the boot process. This is the most common run level for desktop or workstation use. Runlevel 6 - Reboots the system. Another runlevel that, for obvious reasons, you are unlikely to want as your default. The default runlevel for an CentOS 6 system is defined within the /etc/inittab file. To identify the current default level or change the default to a different setting, load this file into an editor (keeping in mind that root privileges will be required). This tells the init process that the default run level for the system is runlevel 3. To change to a different run level simply change the number to the desired runlevel and save the /etc/inittab file. The desktop environment will then start up and the login screen will be displayed. There are number of ways to identify which services get started without having to delve into the /etc/rc.d sub-directories.